On October 10, 2011, the Supreme Council of the Armed Forces (SCAF) ordered the cabinet to set up a fact-finding committee to investigate the Maspero massacre. The full findings were never made public, but in media interviews, the committee shared its conclusion that a group of thugs infiltrated the demonstrations and spurred the chaos, attacking both protesters and the military. On October 10, 2011, the National Council for Human Rights (NCHR) created a fact-finding committee on Maspero. Its report, made public, found that 321 were injured and 28 were killed, at least 12 of whom were run over and crushed by military armored vehicles. The report placed blame on a number of parties, including Egyptian television, for inciting against Coptic protesters, but was not conclusive on whether the military used live ammunition against protesters. On July 5, 2012, President Muhammad Morsi created a fact-finding committee on the killing, attempted killing, and injuring of peaceful protesters across the country between January 25, 2011, and June 30, 2012—a period of time which includes the Maspero massacre. Although the committee engaged with the media to a limited extent, its findings were never made public. Years after the Maspero violence, the Association for Freedom of Thought and Expression, an Egyptian civil society organization, released the results of its independent research in a report documenting the events leading up to the incident, the massacre itself, and the state response. Following the Maspero massacre, an investigative judge conducted investigations implicating more than 30 civilians, among them blogger Alaa Abdel Fattah, reportedly present at Maspero, for inciting sectarian strife, disturbing public security, and attacking security forces. Most investigations were closed because of a lack of evidence, but in April 2012, two Coptic men were referred to trial before a criminal court and ultimately sentenced in February 2013 to three years in prison for reportedly stealing weapons from the armed forces. On September 14, 2012, and following a trial before military court, three members of the armed forces were found guilty of unintentionally killing protesters during the Maspero massacre after the court found “negligence and a lack of precaution while the men were driving military armored vehicles belonging to the armed forces.” Two of the men were sentenced to two years in prison, while the third was sentenced to three years in prison. No high-ranking government, military, or police officials have been held accountable for the Maspero massacre. Despite attempts by the families of the victims to submit complaints to the prosecutor-general requesting the referral of military officials in high-ranking positions at the time of the massacre—including Field Marshal Muhammad Hussein Tantawi, Lieutenant General Sami Anan, Major General Hamdy Badeen, and Major General Ibrahim Damati—to criminal prosecution, these complaints were left unaddressed. Defense Minister and Chairman of SCAF Field Marshal Muhammad Hussein Tantawi remained in his position as the de facto head of state until Morsi was inaugurated as president and ordered Tantawi into retirement in 2012. Vice-Chairman of SCAF and Chief of Staff of the Armed Forces Lieutenant General Sami Anan remained in his position until August 2012, when he was forced into resignation by Morsi. After announcing his presidential candidacy for the 2018 election, he was arrested on forgery charges and remains in detention, though no charges have been brought against him in relation to potential human rights abuses. Commander of the Military Police Major General Hamdy Badeen, accused of leading his troops to kill civilian protesters, remained in his position until August 2012, when he took the position of military attaché to China. He is currently the director of the General Authority for Fish Resources Development. April 2016, Damati headed the Armed Forces’ National Service Project Organization, though he has since been replaced in the post. Following the Maspero massacre, 21 Egyptian civil society organizations came together to “condemn the unprecedented extrajudicial killings and acts of violence committed by military police and central security forces” at Maspero and to call for the creation of an independent fact-finding committee to investigate the military’s involvement in the events. In a press conference after the Maspero massacre, SCAF described the massacre as “clashes between Muslims and Christians.” SCAF ignored the media’s culpability in the events, denied that the soldiers were armed with live ammunition, and stated that the military does not believe in running over people. 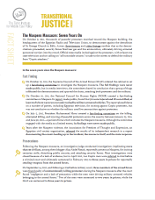 transitional justice,” citing its failure to fully investigate several incidents including the Maspero massacre. On the fifth anniversary of the Maspero massacre in October 2016, the Ministry of Interior refused to grant a protest permit to the Maspero Youth Union, which was seeking to hold a commemorative rally in honor of the victims of the massacre.